Carbon paper is an inexpensive reprographic device used to make a single copy concurrently with the original, as in credit card transaction receipts, legal documents, manuscripts, letters, and other simple forms. Even up to the twentieth century, copying documents for business purposes was a difficult, labor-intensive process. Copy clerks, like the scribes of churches and government offices before them, were common in the business offices of the nineteenth century. The first attempt at copying important business correspondence is attributed to the Scottish engineer James Watt, who improved the steam engine. Watt disliked trusting scribes to copy business letters, so he invented a method of pressing a tissue paper that had been moistened with special liquids onto an original, which had been written using special ink. By 1779, he was ready to market the process, but it didn't catch on. In 1806 Ralph Wedgwood invented the Stylographic Manifold Writer. A paper saturated with printer's ink was placed between a piece of tissue paper and a piece of regular paper. A metal stylus then scratched an impression onto the tissue paper, creating a copy that read correctly and another that was a mirror image, though easily read through the thin tissue paper. It was necessary to prepare copies in this manner because the pens of the time (quills) couldn't press hard enough, and pencils could be erased. Around 1820 it became possible to use paper that had been inked on one side only and an indelible pencil to produce the original. This early carbon paper was not a huge success, apparently because business owners, fearing forgery, preferred items written in ink. In 1823 Cyrus P. Dakin began making carbons, papers coated with oil and carbon black. In the 1860s Lebbeus H. Rogers attempted to sell these carbons to businesses, but it wasn't until the invention of the type-writer in 1867 that carbon paper came to be accepted (typewriters produced a cleaner copy as well as a quality original). Rogers originally made carbon paper by placing paper on a stone table and slathering it with a mixture containing carbon black (soot), oil, and naphtha (a liquid hydrocarbon). Later he developed a machine that applied hot wax to the carbon paper, doing away with the manual brushing. The production of carbon paper has stayed basically the same since Rogers's technological advances. In a quaint manufacturing tradebook put out around the turn of this century, carbon paper is described as consisting of various pigments, including carbon black, and wax or oils brushed onto thin, strong paper. While modern carbon paper is made using essentially the same formula, manufacturers have concentrated on increasing the cleanliness of the process and improving the quality of the reproduction by using more refined materials. The key ingredient in carbon paper is carbon black. To make it, air and a hydrocarbon (such as petroleum oil) are fed into a furnace. In the furnace, part of the petroleum oil undergoes combustion, helping to raise the temperature up to 3,000 degrees Fahrenheit and causing the unburned hydrocarbon to decompose to carbon black. 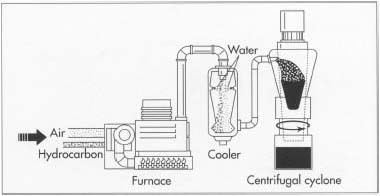 The carbon black is then cooled with water and recovered by putting in a centrifugal cyclone or bag filter. fine, spherical, amorphous form of carbon that is not as crystalline as graphite. Mostly carbon, it also contains small amounts of oxygen, hydrogen, and sulfur. The carbon black adheres to the paper with the help of various waxes. Familiar one-time black carbon paper (the kind used for credit card receipts, for example) is coated with a mixture commonly composed of paraffin wax (33%), mineral oil (25%), carbon black (15%), china clay or kaolin (12%), montan wax (8%), carnauba wax (6%), and methyl violet or gentian violet (1%). Less common one-time blue carbon paper is commonly coated with a mixture composed of iron blue (21%), paraffin wax (20%), petrolatum (20%), mineral oil (15%), carnauba wax (10%), china clay (10%), and montan wax (4%). Some carbon paper can be reused. This comes in handy for use in sales books, for example, because only one sheet of carbon paper is needed to write out receipts for several sales. Reusable oil-soluble pencil carbon produces indelible copy. It is commonly coated with a mixture of talc (39%), carnauba wax (23%), lard oil (16%), oleic acid (15%), and victoria blue base (7%). Reusable pigment pencil carbon paper produces erasable copy. It is coated with a mixture that commonly consists of milori blue (25%), carnauba wax (20%), mineral oil (16%), amber petrolatum (11%), petrolatum (11%), toning iron blue (10%), and paraffin wax (7%). Typewriter carbon is also reusable, and because of the heavy striking force of the typewriter key, it uses higher quality carbon black and finer ingredients than one-time or pencil carbon paper. It is commonly coated with an ink that consists of carnauba wax (32%), mineral oil (26%), carbon black (12%), amber petrolatum (6%), beeswax (5%), ouricury wax (5%), ozokerite wax (5%), oleic acid (3%), pigmented purple toner (3%), crystal violet dye (2%), and victoria blue base (1%). For further protection, it also has a backing wax composed of carnauba wax (40%), ouricury wax (40%), and microcrystalline wax (20%). Carbon paper's most important ingredient, carbon black, has changed in recent years. Before 1940, 90 percent of the carbon black produced in the United States was made from channel or impingement carbon, where tiny jets of gas flame impinged (struck) onto a cool metallic surface, such as an iron channel (or groove). The resultant soot from the partial combustion was then scraped off, producing carbon particles of approximately 10 -8 meters in diameter This superb method of creating fine carbon black was abandoned in 1976, however, because of a large increase in the price of natural gas. The current method of producing carbon black uses the furnace process, described below. The finished carbon black is then coated onto paper using a series of offset rollers. 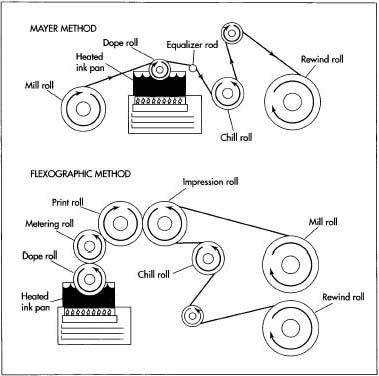 Two methods used to produce one-time carbon paper are the Mayer Method and the Flexographic Method. The two methods are similar in that both feature paper moving around a series of rolls, one of which contacts a carbon ink pan. to 2,012-3,092 degrees Fahrenheit (1100-1,700 degrees Celsius). At this temperature, the unburned hydrocarbon decomposes to carbon black. 2 The newly created carbon black is routed to a cooler, where it is sprayed with water. The fine black substance is then recovered using a centrifugal cyclone or a bag filter. 3 A large roll of coating paper (called the mill roll) unwinds and passes over another roll (the dope roll) sitting in a pan of carbon ink. The ink pan has been heated to between 168.8 and 179.6 degrees Fahrenheit (76 and 82 degrees Celsius). As the paper passes over this roll, the heated ink is transferred onto one side of the paper. 4 Next, the paper passes over an equalizer rod, which scrapes the coated paper to smooth it out and remove excess ink. The equalizer rod may be either smooth or ridged. The paper then passes over another roll, the chill roll, which cools and solidifies the ink onto the paper. Finally, the completed paper is rewound onto another roll. 5 In the case of manifold business forms, the carbon paper is glued to another form, so the paper must have an uncoated strip without carbon where the adhesive can be applied. To accomplish this in the Mayer method, a strip of metal is simply placed in the proper place on the dope roll. This part of the roll thus picks up no ink from the ink pan to pass onto the paper. The final step in carbon paper manufacture is perforation. This is performed automatically by a spot carbonizer-processing machine and includes both the perforations between sheets of carbon paper and the tiny holes (produced by slitting) along the edges of the paper. squeezes the ink to a uniform thickness. The ink is then transferred to a third roll, the print roll. 7 Meanwhile, the paper is fed from a mill roll onto an impression roll that contacts the print roll, the third roll mentioned in step #5 above. When these two rolls come into contact, ink from the print roll is passed onto the paper on the impression roll. The paper then passes over a chill roll that solidifies the ink, before being rolled onto the rewind roll. For manifold business forms being produced with the Flexographic method, a shallow groove is formed on the print roll. Where this groove contacts the paper on the impression roll, no ink gets transferred. 8 The final stage in the manufacture of one-time carbon paper is perforation. First, the carbon and the printed forms are slitted while they are being collated. Next, the huge rolls of carbon paper are cut into forms or sheets of the proper size. If necessary, line holes can also be punched into the paper. All of these operations are carried out automatically by a spot carbonizer-processing machine. Finally, the paper is stacked, boxed, and shipped to the customer. Typewriter carbon paper differs from one-time carbon paper in that it usually has an ink coating and backing wax, as well as printed material on the back. In this production method, a Flexographic set-up comprising a dope roll, metering roll, print roll, and impression roll provides the means to print on the back of paper that has been supplied from a mill roll. After printing, the paper passes over a dope roll to receive a carbon ink coating that is smoothed with an equalizer rod as in the Mayer method. Next, the paper travels to a wax dope roll, which coats it with backing wax. As in the other methods, a chill roll then solidifies the wax. 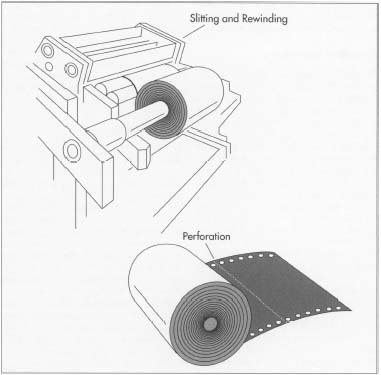 A felt buffing roll is sometimes used to improve the product's appearance before it is rolled onto a rewind roll. The principle behind carbon paper is simple, yet producing it is difficult. A modern manufacturer of carbon paper tests all incoming raw materials for quality. A large number of tests can be applied to carbon black, including those for pigments and sulfur content. The carbon black selected should also be of fine particle size, which is determined by measuring the average diameter of a carbon black particle with an electron microscope. In addition, it should have low oil absorption, and the absorbency and pH of the carbon black are tested prior to use. The inks are tested for fineness of grain, which affects the final smoothness of the coating. The wax binder should penetrate only slightly into the paper and have the proper viscosity. To ensure proper lettering, the amount of wax released under pressure is tested. The paper itself should be smooth, nonporous, and free of surface defects. Although it must be a thin tissue, it should also be strong and dense. The finished carbon paper must be free of defects: no offset, flaking, wrinkles, or curl. It must work properly; the resultant copy must be clean and legible. The coating should be hard enough to meet its intended use; for example, one-time carbon doesn't require as hard a coating as typewriter carbon, which must also have a compounded coating of good color so it can be reused. Other tests exist for finished carbon paper. To determine the amount of ink that was deposited, a specimen of carbon paper is selected and weighed. Its deposit of ink is then chemically removed before it is reweighed. The difference in weight indicates the amount of ink deposited. Curl is a frequent complaint about carbon paper, even though carbon paper is frequently coated on both sides (one side with the carbon, the other with backing wax) to combat the problem. To test for curl under different conditions, a piece of carbon paper is placed on a flat surface and, under controlled temperature, subjected to different humidities. The durability of reusable typewriter carbon paper is checked by repeatedly typing on one space until the carbon wears out. The cleanliness of both the copy and the carbon paper itself is important. To test the first, a document is typed and the copy is examined to see if it is clean. To test the second, the carbon side is rubbed with a clean, crumpled sheet of paper, which is then examined to see how much carbon has rubbed off. The color and thickness of the carbon must be inspected visually to see if they meet quality standards. In 1991, over 62,000 metric tons of carbon paper were produced in the United States. However, during the same period, over 600,000 metric tons of carbonless transfer paper were manufactured. Ideal for handwritten records, carbonless paper utilizes chemically coated sheets that react under pressure, producing a colored image. Although carbonless paper weighs significantly more than carbon paper and is less suitable for typewritten and computerized records, its demand is increasing at the expense of carbon paper. (This demand for "regular" paper can also be attributed to the increasing availability of photocopiers.) It is likely that, as electronic communication becomes more prevalent, carbon paper will become obsolete. Presently, though, there is enough demand from businesses that utilize carbon paper for credit card receipts and computerized records to insure the survival of this simple, inexpensive product for some time to come. Casey, James P. Chemistry and Chemical Technology, Vol. IV, Pulp and Paper. John Wiley and Sons, 1983. Mantell, Charles L. Carbon and Graphite Handbook. John Wiley and Sons, 1968. The Manufacture of Pulp & Paper: Science & Engineering Concepts. Technical Association of the Pulp & Paper Industry, 1988. Mosher, Robert H. and Dale S. Davis. Industrial and Specialty Papers, Vol. III: Applications. Chemical Publishing, 1969. Proudfoot, W. B. The Origin of Stencil Duplicating. Hutchinson and Company, 1972. I am a user of large sheets (30" x 36") of both single and double sided carbon paper in the granite monument trade. The currently available paper I now use is of low quality and does not produce a good print. Also it does not have the "smooth" drawing capabilities of the older carbon paper I used to purchase. Is any of the high quality paper still being made? IS there any other raw materials that can be used in making CARBON PAPERS? Was helpful for someone (me), who didn't know about carbon paper. I do have one question. Is there a wood that can be used for creating carbon paper or is it completely man- made?